Jimmy DiResta’s video series on Make: is one of our most popular, inspiring viewers by showing the master craftsman create beautiful and clever works of art from largely reclaimed materials. 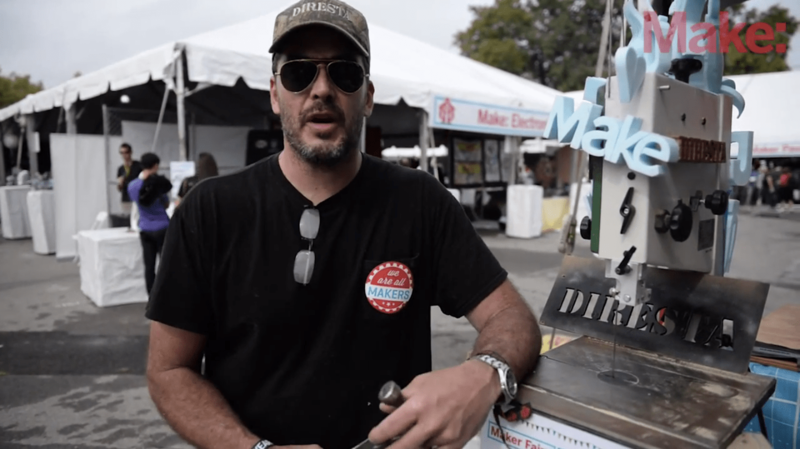 He and his bandsaw are also regulars at our World Maker Faire New York booth every year, and this past weekend we caught up at the event to see some of his on-site builds and hear about what being at Maker Faire means to him. DiResta also took a moment during filming to turn my oversized clip board into something that would fit nicely into my toolbelt, and gave it his personalized touch. Make sure to subscribe to the Make: youtube channel so you don’t miss any of DiResta’s videos. You can also catch him building stuff on the TV shows Dirty Money, Hammered, Against the Grain, and Trash for Cash.